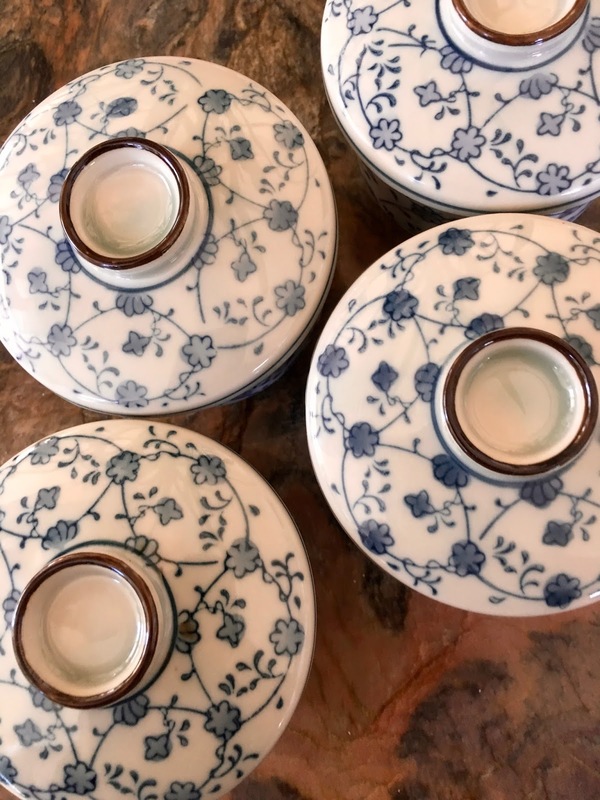 The city of Shunde in the Pearl River Delta, downstream from the capital city of Guangzhou and north of Hong Kong, is home to most of China’s milk dishes. No one really knows why milk is such a big deal here, for beef certainly isn’t, but there you have it. 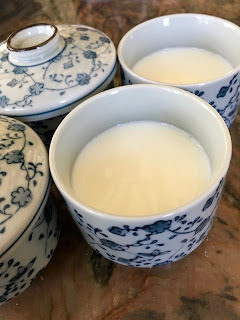 Cow’s milk is a true rarity in the traditional cuisines of China, although it has become more common over the past couple of decades as a beverage or as a major ingredient in things like ice cream and yogurt. Back when I was a student in Taiwan during the late seventies, though, the only milk to be had was powdered, and seeing Klim powdered milk in its iconic big yellow can still makes me nostalgic. Over the following decades, fresh milk made quite a headway in local diets, mainly because parents wanted to increase their calcium intake, and also because who can argue with the joys of ice cream? But Shunde is a completely different bird, culinarily speaking. Milk has traditionally not been consumed fresh there, but rather cooked and used as part of a dish, rather than drunk as a beverage. A lot of this has to do with the Chinese preference for hot foods over cold, but also because so many Chinese people have lactose intolerance. Cooking will not destroy the lactose in milk, but the relatively small amount of milk that is generally used in Shunde’s foods is another reason why it has become an acceptable – and most definitely delicious – part of one of Guangdong’s most delightful cuisines. Most directions for this dish demand that you preserve that skin and return it to the custard just before the final steaming. Honestly, I've tried it many ways and can't see the difference whether I mix the skin back into milk (as in the recipe below) or strain it out or fastidiously reserve it for the top. And so, out goes that step. The customary recipe for this custard calls for nothing more than whole milk, egg whites, and sugar. And so, unlike just about any other custard recipe out there, this classic sweet is pure white. It’s therefore stunning when served with contrasting colors, like red raspberries or in a black bowl or with just a drizzle of honey on top. But because no yolks were used, this custard is also exceptionally mild in taste. You won’t register much beyond the flavor of the milk and sugar. For that reason, use only really good quality whole milk here. You want that richness to shine through. You can make this custard as sweet as you like. It’s quite good with all the sugar mixed into the hot milk, but also exceptional if you reserve the sugar as a crunchy topping. 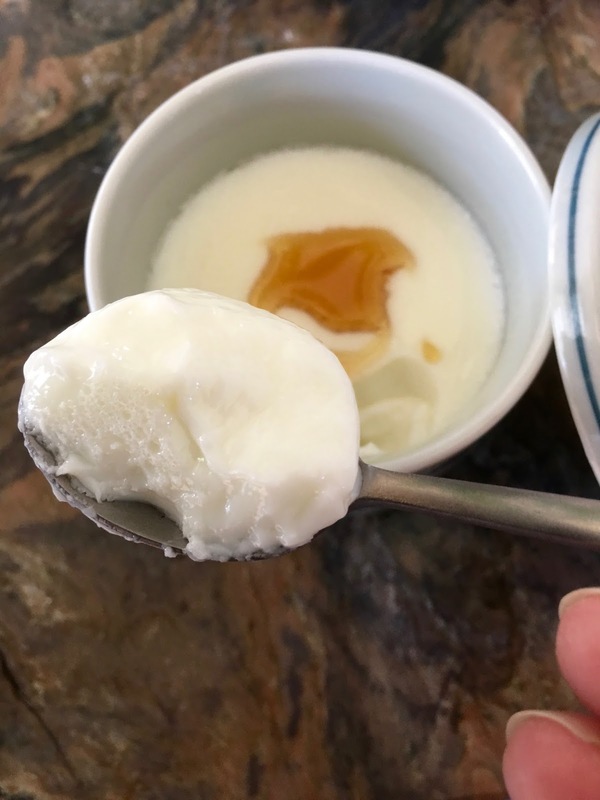 Again, traditionally speaking, in Shunde the sugar is incorporated right into the custard so that it turns this into a genuinely sensuous, smooth dessert. People who are getting over a cold or in some other kind of recovery will probably enjoy this, since it's pure protein, easy to digest, and quite delicious. According to Chinese medicine, you'd want to serve it hot or at least very warm, since cold foods are considered detrimental when the body is weak. That being said, be assured that you can serve this custard chilled, and that makes this especially perfect for a small tumble of fresh fruit on top. A couple of cookies on the side wouldn't hurt, either. This is not at all what Shunde's grandmas do, but I won’t tell them if you won’t. 1. Use a heatproof cup for measuring the milk. Add the sugar and salt to the milk, and then microwave it until the milk is very hot and a skin has formed on top (about 4 minutes on high - see Tips). Let the milk cool down until it is no more than warm to the touch, as you do not want it to curdle the egg whites. 2. 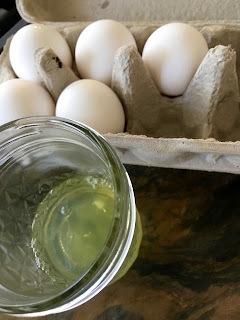 Gently whisk the cooled milk into the egg whites. 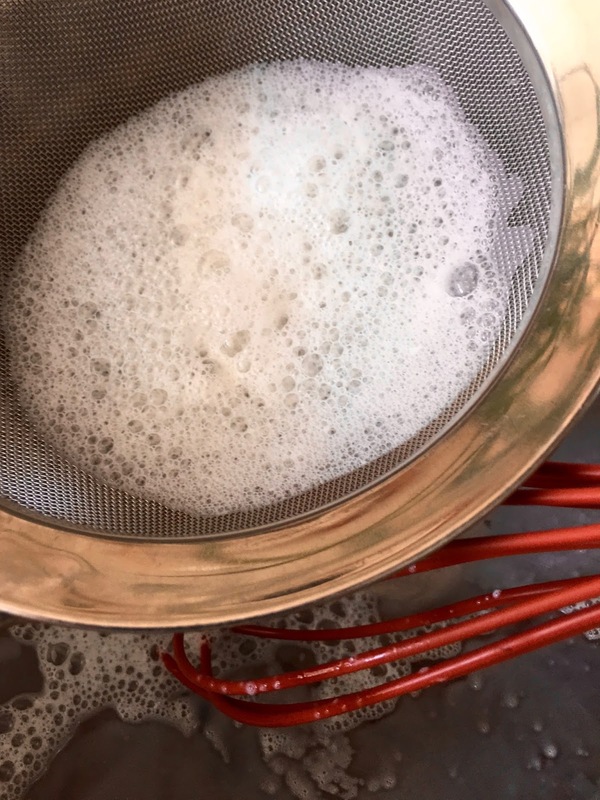 Strain the milk mixture back into the measuring cup and discard any foam and solids in the strainer. 3. 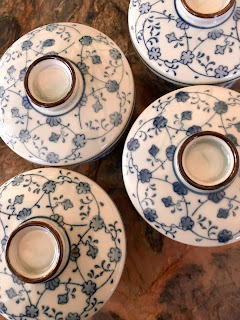 Use 1 large (3 cup / 750 ml) heatproof bowl or 4 smaller covered chawan-mushi (Japanese custard bowls). Set up a steamer that can easily hold whatever you are using here. Divide the milk among the bowls and cover them, either with foil or lids. Steam a large bowl for around 10 minutes and the smaller ones for around 7 minutes. Turn off the heat and let the bowls sit in the hot steamer for another 5 minutes to completely set up. Be sure that you do not over-steam them, as this will ruin the texture. Garnish the custard, if you like, and serve hot or cold or in-between. 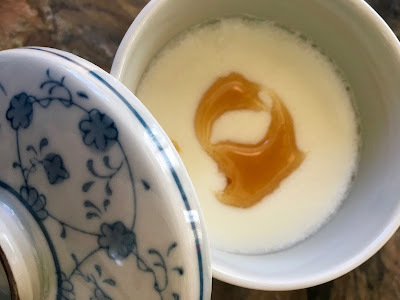 If you want to use a sweet garnish like turbinado sugar, honey, maple syrup, fruit, etc., use no more than 2 teaspoons sugar in the custard itself. Keep an eye on the milk while you heat it in Step 1 if you are not quite sure of its power. You can always microwave the milk in 1 minute spurts if you are at all unclear of how long your microwave takes, since you don't want the milk to boil over and make a mess and ruin your day. I've been on a hiatus from reading much of anything online lately, and I come back to see this, and it absolutely made. My. Day. I was in Shunde two years ago for a choral competition, and the 雙皮牛奶 with ginger was so soothing to a bad throat! I'm so glad to see a recipe for it, I've been thinking about it lately! Thanks for the super kind words! We tried it plain and with ginger, and the one with ginger /really/ was outstanding. Something about the tang that just perked up the entire taste. I'm getting braces put in this weekend so this is going to be one of my recuperation recipes! Glad to be of help. Hope you feel well soon!